Glad to be a part of this community! I've had GIMP 8 on my Windows 7 PC for sometime, but never used it much, because it seemed so complicated compared to other graphics applications. I'm more au fait with Pixlr, but recently discovered an image dimension limit of 4000 x 4000 pixels there. So, I figured it would probably be best to learn whatever I could about GIMP, as I'd always heard it was very feature rich. Anyway, seeing that a stable version of GIMP 2.10 was recently released, I decided to upgrade. Everything seemed to be working fine: it loaded my 7004 x 7680 transparent PNG as an XCF file, and afterwards I cropped it a bit, added a couple layers and some text, all without any issues. However, when I tried exporting my finished work as a PNG, nothing happened. Have any of you experienced the same issue? If so, how did you resolve it? UPDATE: The issue appears to be related to the particular XCF file, because I just tried exporting another one, and it worked just fine. 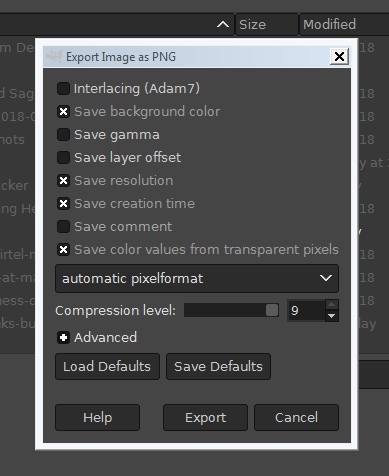 This time the Export Image as PNG dialog popped up (as shown below), and when I clicked Export, it worked perfectly. Maybe there's a problem with the file that won't export. Could be corrupt or something. I don't know. I'm going to delete it and start afresh.